Like a deleted scene from Robin Williams' film, “The Dead Poets Society”, I was first introduced to the work of George William Russell at the age of 17 by an inspirational school teacher who also managed to turn me on to WB Yeats, Shakespeare, Samuel Beckett and Tom Stoppard amongst others. Since that first lighting of the candle I’ve enjoyed delving back into the depths of AE’s work time and time again for inspiration, insight and illumination. 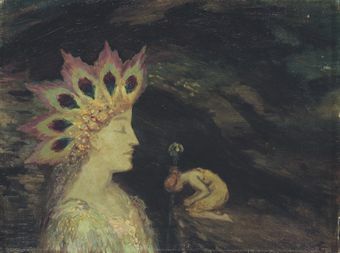 George William Russell was a seer and mystic as well as gifted painter and poet. In addition to these things, he was also a vocal Irish Nationalist and prolific writer who has left a lasting legacy for the world. Russell was born in the grey town of Lurgan (Irish “an Lorgain”) in County Armagh, Ireland on the 10th of April 1867. At the age of eleven his family moved southbound to Dublin. A few years later as a young man, he developed enduring friendships with W B Yeats and Art O’Murnaghan. Somewhat similarly to Annie Besant, Russell devoted much of his life to political, co-operative and labour causes. He worked for a number of years for the co-operative, the Irish Agricultural Organisation Society. 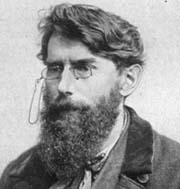 Willie Yeats played a pivotal role in suggested to the co-operative’s founder Horace Plunkett that Russell should become its Assistant Secretary. In this role Russell succeeded in helping to create a host of credit societies and co-operative banks which gave working people a level of unprecedented financial security and comfort. During the fraught time of the 1913 Dublin Lock-out, Russell wrote an powerfully worded open letter to the Irish Times newspaper fiercely criticizing the employers’ bullish attitude. Not being content with progress he then spoke up about the lock-out in England and was hugely contributory towards ending the crisis. Russell continued with his political career by becoming an independent delegate to the 1917-18 Irish Convention where he articulately opposed John Redmond’s poorly thought through compromise on Irish Home Rule. He often used the pseudonym and nom de plume "AE", or more correctly, "Æ". This derived from an earlier name he had explored, "Æ'on", which symbolised the eternal spiritual quest of humanity, subsequently abbreviated. His first collection of poetry, “Homeward: Songs by the Way” (1894), established him fairly and squarely in what was to become known as the Irish Literary Revival. His collected poems were published during 1913, with a second edition being distributed later in 1926. A favourite of mine from this collection is included later in this article. His poetry and prose remain in publication to this day and his painting continues to fetch high prices at auction. Along his way in 1902 Æ met a young James Joyce and played a key networking role for Joyce, introducing him to many other important Irish characters including Yeats. It’s interesting to wonder whether Joyce’s literary career would have taken a different turn without these early introductions. Russell’s house in Dublin’s Rathgar Avenue became a productive hive for artistic and thinking minds. Anyone was welcome there who wished to shine their light on the social, economic, political and artistic future of Ireland. 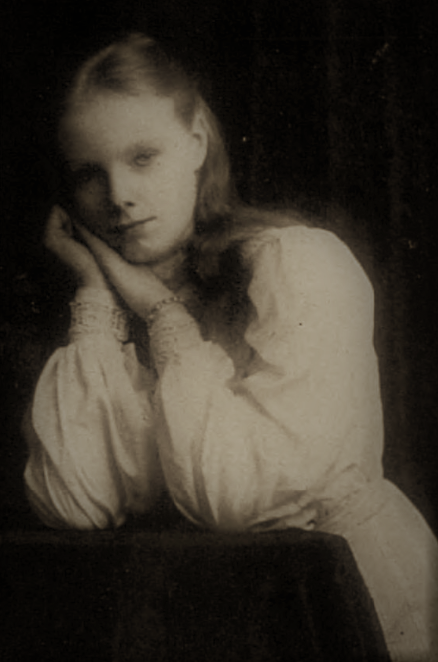 A talented clairvoyant, Æ’s interests and passions also included theosophy and the inner world of humanity. His burgeoning spiritual life was beautifully caught in many of his paintings, prose and poetical works. In many respects he really did manage to manifest in earth the words of power he had once offered to L.A.G. Strong and quoted in this article’s header. 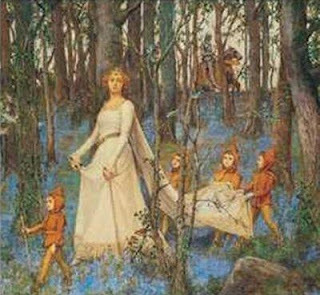 Few are able to bring back the treasures of the faery realms or other magical kingdoms in such a beautiful and lasting way as Æ did. 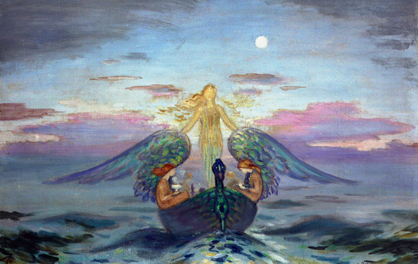 Æ’s was often very successful in capturing and earthing his experiences of the nature side of things, of the Green Ray contacts, particularly in his paintings. 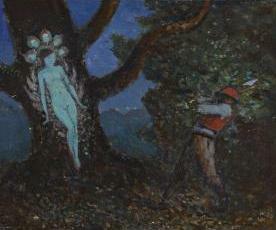 This can be seen in the above painting, or in the captivating picture below of a woodchopper and a tree spirit or dryad. I was delighted to come across Æ again when I first started exploring the magic of the Golden Dawn tradition a few years after my English teacher’s first introductions. In Regardie’s opus “The Tree of Life”, I found Æ’s beautiful vision of a conversation between what can on one level be seen as the mundane self and the Higher Self or Holy Guardian Angel described in a carefully thought out and helpful manner. The passage comes from poem “Glory and Shadow”. Regardie describes the vision as a conversation between the “earthly child of darkness” and the “Holy Angel of Light.” This is an evocative and illuminating work well worth some contemplation for those wishing to open up a more productive dialogue and relationship between these two aspects. Were stars at the dawn. May claim for its throne. And quenched in the peace. Thy heart for its woes. To thee it is due. Over the years I’ve returned to this and other works by Æ for insight, sustenance and, at times, just sheer enjoyment. After his wife’s death in 1932 and towards the end of his life Russell relocated to England. He passed over to the other side on the 17th of July 1935 in Bournemouth, that perennial English seaside town for retired folk on their way to the Great Recycling Plant. His body was returned to be interred in Mount Jerome Cemetery in Dublin’s fair city. Thank you for filling in the details of AE's life. . . And I had no idea Regardie used that beautiful poem . . . The Candle of Vision is one of my favourite books, too - the pages are falling apart in my old copy, which will soon need replacing. Luckily I came across an old hard-back of his collected poems some time ago, which is still in good shape. It was in the 1980s, and I put tunes to some of his poems because they are so rhythmical. They still float through my head sometimes on countryside walks!